“We are from the government and we are here to help you!” – these words inspire distrust in many Americans. I know because I have seen peoples’ reactions as I have uttered them trying to help them in emergencies. Don’t want FEMA to kick your door in? Want to be a good citizen and do your part in an emergency? Download this article as a .pdf, print it and put it in a sheet protector and store it with supplies to tag and flag your home. It will help you a lot. If you have seen pictures of the aftermath of a major disaster, you probably noticed cryptic markings on homes and buildings. Some are from insurance adjusters, some are made by search and rescue personnel and others are graffiti, warnings to looters or pleas for aid. This article will help you understand search and rescue tagging methods and symbols and teach you how to flag your own home. Avoid duplication of effort – thereby speeding rescue and recovery efforts. Speed rescue effort – thereby saving lives and property. Prevent property damage – I’m not saying this is the best way to accomplish this goal under all circumstances, but if you are able to effectively communicate that there are no victims trapped in your home and it poses no danger to surrounding property, then there is less reason for honest responders to break into your home. OPSEC (Operational Security) – prevent others from seeing what resources you have and possibly decide to commandeer them or return with armed officers to do so. You might think, “How selfish!” But there is a difference between voluntarily sharing and being compelled to share, especially if it creates undue hardship or endangers loved ones. Many people consider it a reasonable precaution not put all their cards on the the table. Situational awareness – understanding the markings helps you understand. In the US, FEMA (the Federal Emergency Management Agency) partners with a number of both professional and volunteer emergency management organizations under a program known as the Citizen Corps. These organizations offer training and service opportunities to citizens to better prepare their communities for emergencies too large for their first response infrastructure to handle. Hurricane Katrina exposed many obstacles to communication and joint operations between agencies and departments. All first responders at all levels of government now follow a single SOP (Standard Operations or Operating Procedure) framework called the ICS (Incident Command System) to improve communication and standardize training. In cities that already have a CERT (Community Emergency Response Team) or block captain program, groups of homes (typically 8-10) are organized into blocks with a block captain and assistant or co-captains checking on each block and reporting number of reds and greens to the EOC (Emergency Operations Center) which passes them up the chain to the municipality. If your municipality does not have CERT yet, it will, but the pace at which the program is adopted varies with public perception of municipal risk and exposure to catastrophe. The residents of each home (or the block captains if residents do not flag their own home) flag the home Green (no assistance needed) or Red (assistance needed.) This is accomplished by placing a green or red marker (typically green or red construction paper inside a sheet protector or several feet of green or red flagging tape) to the side of the front door, as long as it is visible from the street. If the front door is not visible from the street, the flag is placed in a conspicuous place that is visible from the street. Flagging or tagging a door right on the doors should be avoided because the marking will not be visible when the door is open. If homes are not flagged, block captains will attempt to size up the situation without entering the home and flag it, but if they suspect (or even imagine) that someone may need help, emergency workers will likely gain entry into your home when they are available to do so. Public Alert Certified All Hazard Radio – without it, you may sleep right through the all-important first hours of many types of emergencies. Headlamp – the power may be out. Turnout bag – a bag containing everything you need to dress quickly and don PPE (Personal Protective Equipment) in an emergency. Sheets of red & green construction paper – stored in a plastic sheet protector with a copy of this article. If you do not have this on hand, a piece of cloth or several feet of flagging tape or anything conspicuously so colored will do. Duct tape – to affix flag. Non-sparking gas wrench – large non-sparking crescent wrench or other tool to shut off gas if necessary. Steel wrenches can spark, resulting in a gas explosion. Aluminum is a more effective material for this application. Water shutoff tool or key – to turn off water main if necessary. First aid/trauma kit – To administer first aid if necessary. Non-contact voltage tick meter – An inexpensive tool to discover live electrical lines without touching them. Make sure you are not seriously injured. The rescuer is the most important person in an emergency. Not only will you not be able to help anyone else if you become a casualty, but you will further strain emergency response resources that are already likely overtaxed. If you jump out of bed and onto glass without your boots on, you are not off to a good start. Hopefully you already have a Public Alert Certified All Hazards Radio. It will issue information and instructions that will aid you in making decisions that will save lives. If you do not have one, turn on a NOAA weather radio or tune AM/FM radios to stations issuing emergency information for your area. These frequencies should be part of your communications plan. Label radios with them. Turn on 2-way radios. 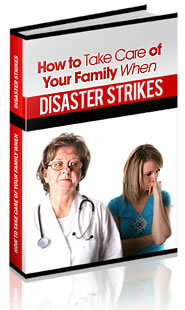 Determine whether anyone in the home needs medical attention. If yes, call for help and flag the home red by taping a piece of red construction paper in a sheet protector to the side of your door or someplace visible from the street, and render first aid. If you are in an apartment, condo or building, tape it on the wall beside your door or entryway where it will be visible to someone walking by. Diagnose and treat the three killers first: breathing/airway, bleeding and shock. Once the patient is stable or you have done all you can do, proceed to the next step. Rescue personnel will go to flagged homes first if communications are down or if the number of injured exceeds their capacity to treat immediately. If no one is injured, tag your home green instead of red and proceed to the next step. If injuries are minor, treat them and proceed to the next step. If family is trapped, flag the home red and rescue the most lightly trapped individuals first so they can help extricate more heavily trapped individuals. Use cribbing to safely extricate those within your ability and know when to go get more help. Walk a complete circle around your home, checking for gas, water, live electrical lines, small fires and structural damage. Gas – if you smell gas, turn it off at the meter by turning the valve 1/4 turn in a clockwise direction. The gas company must run a check and turn it back on. Electrical – in the event of an electrical fire, short or gas leak, turn off main breaker in fuse box. Water – if a water pipe is broken, you will want to turn off water to your home until you can repair it to prevent flooding and water damage. Fire – if you hear, see or smell fire, size them up before attempting to fight them. Extinguish small fires within your ability with a buddy if they are smaller than a kitchen trash can and you have the equipment to safely do so. For larger fires, evacuate and call for help. Structural Damage – if there are dangerous power lines, gas lines, water lines, fires, sunken ground, impaired access, down trees or damage to the structure of the home, it may not be safe to inhabit. Tape off any hazards to prevent injury if it is safe to make repairs, but understand that emergency workers may deem your home inhabitable and ask (force if necessary) you to relocate. This is one reason why everyone should have an evacuation or bug out plan, supplies cached off-site, financial reserves and places to stay. How will you “shelter in place” if your home is leveled? Be able to shelter in place or evacuate as the situation dictate. It’s not the strong who survive, but the adaptable. If you cannot relocate for a time, your contingency plan is less-effective. Make it more effective. Whereas home owners or Block Captains flag their homes red or green to indicate whether or not they are in need of assistance, tagging of structures is typically done by SAR (Search and Rescue) Teams, organizing pertinent information around an “X” symbol. They will typically tag with contrasting colors. Just as with flagging, tagging is done to side of the door, instead of on it, so the tag will be visible even if the door is closed. This article – in a plastic sheet protector, for further reading and knowledge. Marking instruments – choose colors that contrast with your home. Finally, let’s see what to do to rag you home properly. If other structures in your area have already been marked, take note. You may want to sketch what you see or snap a digital photo to help you duplicate the markings. Depending on why you are marking and what you are trying to accomplish, this may be helpful. But SAR Teams do not always follow SOP. After flooding from a hurricane, the SAR Team flagged all the homes by tying Yellow Caution or Crime Scene Tape to the door knobs. This should never happen because you can’t see the flag when the door is open. Things don’t always go as planned in emergencies. Maybe some of their gear didn’t arrive and they borrow crime scene tape form local law enforcement, who knows, but that’s why it’s important that you observe they are tagging if possible. Marking Instrument(s) – What are they using to mark structures? What colors? Time – Are they writing the time or time and date, and in what format? Team Initials – Who is doing the marking? Take note of the initials. Upon completion of a search and extrication and removal of all victims, the SAR Team makes a second diagonal slash, completing an “X” communicating that the search of the structure is complete and that both the victims and searchers are safely out. The SAR Team writes the time operations cease in the structure (and possibly the date) in the 12:00 quadrant of the “X”. The 9:00 quadrant of the “X” is where the team or unit is identified by its initials. Even if you flag with the wrong material, SAR workers will understand the markings. What they conclude upon reading it will be dependent on a host of factors. They may decide it was a local team or the residence belongs to a first responder. Either way, they were going to gain forcible entry to your home before they saw the markings and no one answers when they knock. If they see the markings, they may pass you by, especially if they think it was done by another worker on their team.